Naeki Castle (苗木城) is a mountain castle built in mid 16th century by Toyama Naokado. It is located in Ena, Gifu prefecture. It was very important castle for Oda Nobunaga to protect Mino from Takeda clan. Even this castle is located on the top of mountain, there are huge stone walls which also the basement of the main bailey and Tenshu-kaku. Those stone basement also used huge rocks to built the castle stronger and higher. From the top of Tenshu-kaku, you can see great view of Nakatsugawa area and Kiso River. Naeki castle was built in Tenmon era by Toyama Naokado. Naokado is the second son of Toyama Kagetomo, the lord of Iwamura castle, and married with sister of Oda Nobunaga. His daughter was adapted to Nobunaga and married Takeda Katsuyori. After the death of Naokado, Toyama Tomokatsu became the lord of this castle. After, Iwamura castle was defeated by Katsuyori, Naeki castle became the bleeding edge of Nobunaga against Katsuyori. In 1583, after the Incident at Honnoji, this castle was defeated by Mori Nagayoshi. After the battle of Sekigahara in 1600, Toyama Tomomasa attacked this castle and brought it back to Toyama clan. 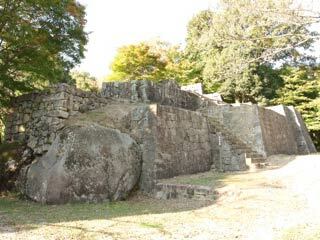 Tenshukaku of Naeki castle was located on the top of mountain. The basement was built on two huge rocks with many stones walls. The size of the Tenshu was 9m x 11m and 3 stories high.